All 2017 Flag Officer assignments for the U.S. Navy. Senior naval officers with a pay-grade of O-7 and above are recognized as Flag Officers and carry the position of admiral, vice admiral, or rear admiral (above the rank of Captain). Rear Adm. (lower half) Ronald C. Copley will be assigned as deputy chief of staff, Intelligence, Resolute Support and deputy director, Intelligence – Plans, U.S. Forces, Kabul, Afghanistan. Copley is currently assigned as director of intelligence, J2, U.S. Strategic Command, Offutt Air Force Base, Nebraska. Rear Adm. (lower half) Jeffrey W. Hughes will be assigned as commander, Navy Personnel Command; and deputy chief of Naval Personnel, Millington, Tennessee. Hughes is currently assigned as commander, Expeditionary Strike Group 2, Virginia Beach, Virginia. Capt. Michael E. Boyle, selected for promotion to rear admiral (lower half), will be assigned as commander, Navy Region Korea; commander, U.S. Naval Forces Korea; and commander, Naval Component, U.S. Forces Korea, United Nations Command, Korea. Boyle is currently assigned as director for international engagement, N52, Office of the Chief of Naval Operations, Washington, District of Columbia. Navy Rear Adm. James S. Bynum will be assigned as director, Assessment Division, N81, Office of the Chief of Naval Operations, Washington, District of Columbia. Bynum is currently assigned as chief of Naval Air Training, Corpus Christi, Texas. Navy Rear Adm. Randy B. Crites will be assigned as deputy assistant secretary of the Navy for Budget (FMB); and director, Fiscal Management Division, N82, Office of the Chief of Naval Operations, Washington, District of Columbia. Crites is currently assigned as director, Assessment Division, N81, Office of the Chief of Naval Operations, Washington, District of Columbia. Navy Rear Adm. (lower half) Charles B. Cooper II will be assigned as commander, Expeditionary Strike Group Seven, Okinawa, Japan. Cooper is currently assigned as commander, Navy Region Korea; commander, U.S. Naval Forces Korea; commander, Naval Component, U.S. Forces Korea, United Nations Command, Korea. Navy Rear Adm. (lower half) Cathal S. O’Connor will be assigned as chief of staff, J5, Joint Staff, Washington, District of Columbia. O’Connor is currently assigned as commander, Expeditionary Strike Group Three, San Diego, California. Navy Reserve Rear Adm. (lower half) Louis C. Tripoli will be assigned as command surgeon, U.S. Pacific Command, Camp H. M. Smith, Hawaii. Tripoli is currently assigned as deputy commander, Navy Medicine East, Portsmouth, Virginia. Navy Reserve Rear Adm. Russell E. Allen will be assigned as reserve deputy director, Warfare Systems Directorate, Office of the Chief of Naval Operations, N9R, Washington, District of Columbia. Allen is currently serving as deputy commander, U.S. Third Fleet, San Diego, California. Navy Reserve Rear Adm. (lower half) Darren J. Hanson will be assigned as deputy commander, U.S. Third Fleet, San Diego, California. Hanson is currently serving as reserve deputy commander, Navy Expeditionary Combat Command, Little Creek, Virginia. Rear Adm. (lower half) Mary C. Riggs will be assigned as director, research and development, Defense Health Agency, Falls Church, Virginia. Riggs is currently serving as commander, Navy Reserve Expeditionary Medicine, Falls Church, Virginia. Capt. James M. Butler, selected for promotion to rear admiral (lower half), will be assigned as reserve deputy commander, U.S. 10th Fleet, Fort Meade, Maryland. Butler is currently serving as community lead, Navy Reserve, Naval Information Force Reserve Headquarters, N9, Fort Worth, Texas. Navy Reserve Rear Adm. (lower half) Keith M. Jones, selected for promotion to rear admiral, will be assigned as deputy commander, Naval Supply Systems Command, Mechanicsburg, Pennsylvania. Jones is currently serving as commander, Navy Expeditionary Logistics Support Group, Williamsburg, Virginia. Navy Reserve Rear Adm. (lower half) Daniel J. MacDonnell, selected for promotion to rear admiral, will be assigned as deputy director, Warfare Integration, N2/N6, Office of the Chief of Naval Operations, Washington, District of Columbia. MacDonnell is currently serving as commander, Naval Information Force Reserve, Fort Worth, Texas. Navy Reserve Rear Adm. (lower half) Thomas W. Marotta, selected for promotion to rear admiral, will be assigned as reserve deputy, Operations, Plans and Strategy, N3/N5, Office of the Chief of Naval Operations, Washington, District of Columbia. Marotta is currently serving as reserve deputy commander, U.S. Naval Forces Central Command, U.S. Fifth Fleet, Manama, Bahrain. Navy Reserve Rear Adm. (lower half) Matthew A. Zirkle, selected for promotion to rear admiral, will be assigned as director, Reserve Innovation Branch, N095, Office of the Chief of Naval Operations, Washington, District of Columbia. Zirkle most recently served as deputy chief of staff, Submarines, NATO Maritime Command, Northwood, United Kingdom. Navy Reserve Rear Adm. (lower half) Alan D. Beal will be assigned as reserve deputy commander, U.S. Naval Forces Central Command, U.S. Fifth Fleet, Manama, Bahrain. Beal is currently serving as deputy commander, Navy Recruiting Command, Millington, Tennessee. Navy Reserve Rear Adm. (lower half) Grafton D. Chase will be assigned as commander, Naval Supply Global Logistics Support Command, San Diego, California. Chase is currently serving as reserve director, Logistics Programs and Business Operations, N41, Office of the Chief of Naval Operations, Washington, District of Columbia. Navy Reserve Rear Adm. (lower half) Kevin C. Hayes will be assigned as reserve deputy commander, U.S. Pacific Fleet, Pearl Harbor, Hawaii. Hayes is currently serving as reserve deputy commander, Naval Surface Force Atlantic, Norfolk, Virginia. Navy Reserve Rear Adm. (lower half) Gene F. Price will be assigned as commander, Naval Information Force Reserve, Fort Worth, Texas. Price is currently assigned as deputy commander, U.S. 10th Fleet, Fort Meade, Maryland. Navy Reserve Rear Adm. (lower half) Alan J. Reyes will be assigned as commander, Navy Expeditionary Logistics Support Group, Williamsburg, Virginia. Reyes is currently assigned as deputy director, Logistics, Fleet Supply and Ordnance, U.S. Pacific Fleet, Pearl Harbor, Hawaii. Navy Reserve Capt. Eugene A. Burcher, selected for promotion to rear admiral (lower half), will be assigned as reserve deputy commander, Submarine Force, Atlantic, Norfolk, Virginia. Burcher is currently serving as deputy, Navy Emergency Preparedness Liaison Officer, Navy Installations Command Headquarters, Washington, District of Columbia. Navy Reserve Capt. Rodney P. DeWalt, selected for promotion to rear admiral (lower half), will be assigned as reserve deputy commander, Navy Expeditionary Combat Command, Little Creek, Virginia. DeWalt is currently serving as commanding officer, Navy Reserve, Navy Installations Command Headquarters, Washington, District of Columbia. Navy Reserve Capt. Joey B. Dodgen, selected for promotion to rear admiral (lower half), will be assigned as deputy commander, U.S. Seventh Fleet, Yokosuka, Japan. Dodgen is currently serving as deputy commander, Navy Region Southeast Reserve Component Command, Jacksonville, Florida. Navy Reserve Capt. Jacquelyn McClelland, selected for promotion to rear admiral (lower half), will be assigned as reserve director, Logistics, Fleet Supply and Ordnance, U.S. Pacific Fleet, Pearl Harbor, Hawaii. McClelland is currently serving as logistics officer, Navy Reserve, Naval Supply Systems Command, Global Logistics Support Headquarters, San Diego, California. Navy Reserve Capt. Andrew J. Mueller, selected for promotion to rear admiral (lower half), will be assigned as deputy commander, Navy Recruiting Command, Millington, Tennessee. Mueller is currently serving as chief of staff, Navy Reserve, Deputy Chief of Naval Operations for Operations, Plans, and Strategy, N3/N5, Office of the Chief of Naval Operations, Washington, District of Columbia. Navy Reserve Capt. Richard A. Rodriguez, selected for promotion to rear admiral (lower half), will be assigned as deputy commander, Naval Special Warfare Command, San Diego, California. Rodriguez most recently served as chief of staff, Combined Joint Task Force, Horn of Africa, Camp Lemonnier, Djibouti. Rear Adm. (lower half) Cedric E. Pringle will be assigned as commander, Expeditionary Strike Group Three, San Diego, California. Pringle is currently serving as deputy commander, Joint Interagency Task Force-South, U.S. Southern Command, Key West, Florida. Capt. Sara A. Joyner, selected for promotion to rear admiral (lower half), will be assigned as the lead for the aviation physiological episodes (PE) effort, Washington, District of Columbia. Joyner is currently serving as director, Navy Senate Liaison, Office of Legislative Affairs, Washington, District of Columbia. Rear Adm. (lower half) Jon C. Kreitz will be assigned as deputy director for operations, Defense POW/MIA Accounting Agency, Pearl Harbor, Hawaii. Kreitz is currently serving as president, Board of Inspection and Survey, Virginia Beach, Virginia. Rear Adm. (lower half) Ross A. Myers, selected for promotion to rear admiral, will be assigned as director, plans and policy, J5, U.S. Cyber Command, Fort Meade, Maryland. Myers is currently serving as commander, Carrier Strike Group 15, San Diego, California. Rear Adm. (lower half) John W. Tammen, selected for promotion to rear admiral, will be assigned as director, Undersea Warfare Division, N97, Office of the Chief of Naval Operations, Washington, District of Columbia. Tammen is currently serving as commander, Submarine Group Nine, Silverdale, Washington. Capt. Yvette M. Davids, selected for promotion to rear admiral (lower half), will be assigned as senior military advisor to the assistant secretary of state for political-military affairs, Washington, District of Columbia. Davids is currently serving as assistant chief of staff for requirements, assessments, experimentations, and innovations, U.S. 3rd Fleet, San Diego, California. Capt. Fred I. Pyle, selected for promotion to rear admiral (lower half), will be assigned as deputy director, ECJ-5, U.S. European Command, Stuttgart, Germany. Pyle is currently serving as executive assistant to the deputy chief of naval operations, integration of capabilities and resources, N8, Office of the Chief of Naval Operations, Washington, District of Columbia. Rear Adm. Roy J. Kelley will be assigned as commander, Naval Air Force, U.S. Atlantic Fleet, Norfolk, Virginia. Kelley is currently serving as director, Joint Strike Fighter Fleet Integration, Washington, District of Columbia. Rear Adm. (lower half) William D. Byrne Jr., will be assigned as commander, Carrier Strike Group 15, San Diego, California. Byrne is currently serving as commander, Carrier Strike Group 11, Everett, Washington. Rear Adm. (lower half) Gregory N. Harris will be assigned as commander, Carrier Strike Group 11, Everett, Washington. Harris is currently serving as commander, Naval Aviation Warfighting Development Center, Fallon, Nevada. Rear Adm. (lower half) Dale E. Horan will be assigned as director, Joint Strike Fighter Fleet Integration, Washington, District of Columbia. Horan is currently serving as commander, Carrier Strike Group 8, Norfolk, Virginia. Capt. Daniel L. Cheever, selected for promotion to rear admiral (lower half), will be assigned as commander, Naval Aviation Warfighting Development Center, Fallon, Nevada. Cheever is currently serving as chief of staff, Naval Air Force, U.S. Pacific Fleet, San Diego, California. Rear Adm. Colin G. Chinn will be assigned as joint staff surgeon, Joint Staff, Washington, District of Columbia. Chinn is currently serving as director, research and development, Defense Health Agency, Falls Church, Virginia. Rear Adm. (lower half) Daryl L. Caudle, selected for promotion to rear admiral, will be assigned as commander, Submarine Force, U.S. Pacific Fleet, Pearl Harbor, Hawaii. Caudle is currently serving as director, plans and operations, U.S. Naval Forces Europe-Africa/U.S. 6th Fleet; deputy commander, U.S. 6th Fleet; commander, Submarines, Allied Naval Forces South; and commander, Submarine Group Eight, Naples, Italy. Rear Adm. (lower half) Scott D. Conn will be assigned as director, Air Warfare Division, N98, Office of the Chief of Naval Operations, Washington, District of Columbia. Conn is currently serving as commander, Carrier Strike Group Four, Norfolk, Virginia. Rear Adm. (lower half) Samuel J. Paparo Jr., will be assigned as commander, Carrier Strike Group Ten, Norfolk, Virginia. Paparo is currently serving as Navy corporate fellow in Corporate Strategy, Lockheed Martin, Bethesda, Maryland. Capt. William S. Dillon, selected for promotion to rear admiral (lower half), will be assigned as commander, Naval Safety Center, Norfolk, Virginia. Dillon is currently serving as vice commander, Naval Air Systems Command, Patuxent River, Maryland. Capt. William C. Greene, selected for promotion to rear admiral (lower half), will be assigned as deputy chief of staff for Fleet Maintenance, U.S. Pacific Fleet, Pearl Harbor, Hawaii. Greene is currently serving as deputy commander, logistics, maintenance, and industrial operations (SEA-04), Naval Sea Systems Command, Washington, District of Columbia. Rear Adm. (lower half) James S. Bynum, selected for promotion to rear admiral, will be assigned as chief of Naval Air Training, Corpus Christi, Texas. Bynum is currently serving as commander, Carrier Strike Group Nine, San Diego, California. Rear Adm. (lower half) Stephanie T. Keck will be assigned as deputy commander, Joint Interagency Task Force-South (JIATF-S), U.S. Southern Command, Key West, Florida. Keck is currently serving as deputy director, operations and intelligence integration, JITDA, Washington, District of Columbia. Rear Adm. (lower half) Andrew C. Lennon will be assigned as deputy chief of staff, Submarines, Allied Maritime Command, Northwood, UK. Lennon is currently serving as reserve deputy commander, Naval Submarine Force, U.S. Atlantic Fleet, Norfolk, Virginia. Rear Adm. (lower half) Michael A. Wettlaufer will be assigned as commander, Carrier Strike Group Three, Bremerton, Washington. Wettlaufer is currently serving as deputy director for plans and policy, ECJ-5, U.S. European Command, Stuttgart, Germany. Capt. Edward L. Anderson, selected for promotion to rear admiral (lower half), will be assigned as director, Fleet Readiness Division, San Diego, California. Anderson is currently serving as major program manager for integration, Program Executive Officer for Command, Control, Communications, Computers, and Intelligence, San Diego, California. Capt. Stuart P. Baker, selected for promotion to rear admiral (lower half), will be assigned as director, operations and plans, N31, Office of the Chief of Naval Operations, Washington, District of Columbia. Baker most recently served as executive assistant to commander, U.S. Fleet Forces Command, Norfolk, Virginia. Capt. Michael D. Bernacchi Jr., selected for promotion to rear admiral (lower half), will be assigned as commander, Naval Service Training Command, Great Lakes, Illinois. Bernacchi is currently serving as special assistant to the Chief of Naval Personnel, Arlington, Virginia. Capt. Frank M. Bradley, selected for promotion to rear admiral (lower half), will be assigned as director, Transregional Threat Coordination Cell, J5, Joint Staff, Washington, District of Columbia. Bradley is currently serving as executive assistant to the chairman, Joint Chiefs of Staff, Joint Staff, Washington, District of Columbia. Capt. Daniel L. Cheever, selected for promotion to rear admiral (lower half), will be assigned as chief of Naval Air Training, Corpus Christi, Texas. Cheever is currently serving as chief of staff, Naval Air Force, U.S. Pacific Fleet, San Diego, California. Capt. Brian P. Fort, selected for promotion to rear admiral (lower half), will be assigned as commander, Navy Region Hawaii; and commander, Naval Surface Group, Middle Pacific, Pearl Harbor, Hawaii. Fort is currently serving as assistant chief of staff, Naval Surface Force, U.S. Atlantic Fleet, Norfolk, Virginia. Capt. Peter A. Garvin, selected for promotion to rear admiral (lower half), will be assigned as commander, Navy Recruiting Command, Millington, Tennessee. Garvin is currently serving as executive assistant to the vice chairman, Joint Chiefs of Staff, Joint Staff, Washington, District of Columbia. Capt. William J. Houston, selected for promotion to rear admiral (lower half), will be assigned as deputy commander, Joint Functional Component Command – Global Strike, U.S. Strategic Command, Offutt Air Force Base, Nebraska. Houston is currently serving as director, Submarine/Nuclear Power Distribution, PERS-42, Navy Personnel Command, Millington, Tennessee. Capt. Frederick W. Kacher, selected for promotion to rear admiral (lower half), will be assigned as executive officer, Supreme Allied Commander Europe, Mons, Belgium. Kacher is currently serving as chief of staff, Naval Surface Force, U.S. Pacific Fleet, San Diego, California. Capt. Timothy C. Kuehhas, selected for promotion to rear admiral (lower half), will be assigned as director, fleet and joint training, N7, U.S. Fleet Forces Command, Norfolk, Virginia. Kuehhas is currently serving as commanding officer, USS George Washington (CVN 73), Norfolk, Virginia. Capt. Carl A. Lahti, selected for promotion to rear admiral (lower half), will be assigned as director, Energy and Environmental Readiness Division, N45, Office of the Chief of Naval Operations, Washington, District of Columbia. 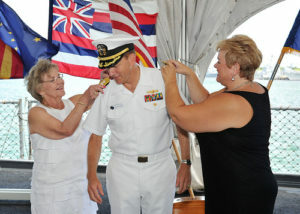 Lahti is currently serving as chief of staff, Navy Installations Command, Washington, District of Columbia. Capt. Andrew J. Loiselle, selected for promotion to rear admiral (lower half), will be assigned as deputy director for Future Joint Force Development, J7, Joint Staff, Suffolk, Virginia. Loiselle is currently serving as executive assistant to the deputy chief of naval operations for operations, plans and strategy, N3N5, Office of the Chief of Naval Operations, Washington, District of Columbia. Capt. John A. Okon, selected for promotion to rear admiral (lower half), will be assigned as commander, Naval Meteorology and Oceanography Command; and oceanographer and navigator of the Navy. Okon is currently serving as executive assistant to the deputy chief of naval operations for information warfare and director of naval intelligence, Office of the Chief of Naval Operations, Washington, District of Columbia. Capt. Douglas G. Perry, selected for promotion to rear admiral (lower half), will be assigned as director, N3 joint and fleet operations, U.S. Fleet Forces Command, Norfolk, Virginia. Perry is currently serving as chief of staff, U.S. Strategic Command Special Activities Atlantic/Submarine Force, U.S. Atlantic Fleet, Norfolk, Virginia. Capt. Erik M. Ross, selected for promotion to rear admiral (lower half), will be assigned as president, Board of Inspection and Survey, Virginia Beach, Virginia. Ross is currently serving as chief of staff, Naval Surface Force, U.S. Atlantic Fleet, Norfolk, Virginia. Capt. Paul J. Schlise, selected for promotion to rear admiral (lower half), will be assigned as deputy commander, U.S. Naval Forces, U.S. Central Command; and deputy commander, U.S. Fifth Fleet, Manama, Bahrain. Schlise is currently serving as deputy for weapons and sensors, N96C, Office of the Chief of Naval Operations, Washington, District of Columbia. Capt. Michael W. Studeman, selected for promotion to rear admiral (lower half), will be assigned as director, J2, U.S. Southern Command, Doral, Florida. Studeman is currently serving as commander, Joint Intelligence Operations Center, U.S. Cyber Command, Fort Meade, Maryland. Capt. James P. Waters III, selected for promotion to rear admiral (lower half), will be assigned as director, Maritime Headquarters, N03, U.S. Pacific Fleet, Pearl Harbor, Hawaii. Waters is currently serving as deputy executive director, Office of the Chief of Naval Personnel, Arlington, Virginia. Rear Adm. Matthew J. Carter will be assigned as deputy commander, U.S. Pacific Fleet, Pearl Harbor, Hawaii. Carter is currently serving as commander, U.S. Naval Forces, Japan; and commander, Navy Region Japan, Yokosuka, Japan. Rear Adm. Lawrence B. Jackson will be assigned as deputy director for strategic initiatives, J5, Joint Staff, Washington, District of Columbia. Jackson is currently serving as director, strategy, policy, programs, and logistics, J4/5, U.S. Transportation Command, Scott Air Force Base, Illinois. Rear Adm. Patrick A. Piercey will be assigned as director of operations, J3, U.S. Pacific Command, Camp H. M. Smith, Hawaii. Piercey is currently serving as commander, Naval Surface Force, U.S. Atlantic Fleet, Norfolk, Virginia. Rear Adm. (lower half) Randy B. Crites, selected for promotion to rear admiral, will be assigned as director, Assessment Division, N81, Office of the Chief of Naval Operations, Washington, District of Columbia. Crites is currently serving as commander, Submarine Group Ten, Kings Bay, Georgia. Rear Adm. (lower half) James W. Kilby, selected for promotion to rear admiral, will be assigned as director, warfare integration, N9I, Office of the Chief of Naval Operations, Washington, District of Columbia. Kilby is currently serving as commander, Carrier Strike Group One, San Diego, California. Rear Adm. (lower half) Bret C. Batchelder, selected for promotion to rear admiral, will be assigned as director, Joint Fleet Operations, N3/N5, U.S. Fleet Forces Command, Norfolk, Viginia. Batchelder is currently serving as commander, Navy Warfare Development Command, Norfolk, Virginia. Rear Adm. (lower half) James J. Malloy, selected for promotion to rear admiral, will be assigned as vice director for operations, J3, Joint Staff, Washington, District of Columbia. Malloy is currently serving as commander, Carrier Strike Group Ten, Norfolk, Virginia. Rear Adm. (lower half) Tina A. Davidson will be assigned additional duties as director of the Nurse Corps, Washington, District of Columbia. Davidson is currently serving as director, Medical Resources, Plans, and Policy Division, N0931, Office of the Chief of Naval Operations, Washington, District of Columbia. Rear Adm. Brian B. Brown will be assigned as director, Warfare Integration Directorate, N2/N6F, Office of the Chief of Naval Operations, Washington, District of Columbia. Brown is currently serving as deputy commander, Joint Functional Component Command (JFCC) Space, U.S. Strategic Command, Vandenberg Air Force Base, California. Rear Adm. Nancy A. Norton will be assigned as vice director, Defense Information Systems Agency, Fort Meade, Maryland. Norton is currently serving as director, Warfare Integration Directorate, N2/N6F, Office of the Chief of Naval Operations, Washington, District of Columbia. Rear Adm. (lower half) John P. Polowczyk, selected for promotion to rear admiral, will be assigned as vice director, J4, Joint Staff, Washington, District of Columbia. Polowczyk is currently serving as director, Supply, Ordnance and Logistics Operations Division, N41, Office of the Chief of Naval Operations, Washington, District Of Columbia. Rear Adm. (lower half) Peter J. Clarke will be assigned as director, Strategy, Capabilities, Policy and Logistics (TCJ5/4), U.S. Transportation Command, Scott Air Force Base, Illinois. Clarke most recently served as commander, Joint Task Force Guantanamo, U.S. Southern Command, Guantanamo Bay, Cuba. Rear Adm. (lower half) Kathleen M. Creighton will be assigned as deputy commander, Joint Forces Headquarters-Department of Defense Information Networks, Defense Information Systems Agency, Fort Meade, Maryland. Creighton is currently serving as director for Command, Control, Communications and Cyber, J-6, U.S. Pacific Command, Camp H. M. Smith, Hawaii. Rear Adm. (lower half) Gayle D. Shaffer will be assigned as medical officer of the Marine Corps; and director, Health Services, Headquarters U.S. Marine Corps, with additional duties as chief of the Dental Corps, Arlington, Virginia. Shaffer is currently serving as liaison officer, Bureau of Medicine and Surgery, Defense Health Agency; and chief of the Dental Corps, Falls Church, Virginia. Capt. Thomas J. Moreau, selected for promotion to rear admiral (lower half), will be assigned as deputy chief of staff for Fleet Ordnance and Supply; and fleet supply officer, N41, U.S. Fleet Forces Command, Norfolk, Virginia. Moreau is currently serving as commanding officer, Fleet Logistics Center, Norfolk, Virginia. Rear Adm. (lower half) Stephen F. Williamson will be assigned as deputy commander, Logistics, Maintenance, and Industrial Operations (SEA-04), Naval Sea Systems Command, Washington, District of Columbia. Williamson is currently serving as director, Fleet Maintenance, U.S. Pacific Fleet, Pearl Harbor, Hawaii. Capt. Blake L. Converse, selected for promotion to rear admiral (lower half), will be assigned as commander, Submarine Group Nine, Silverdale, Washington. Converse is currently serving as director, N3 Joint and Fleet Operations, U.S. Fleet Forces Command, Norfolk, Virginia. Capt. Kelly A. Aeschbach, selected for promotion to rear admiral (lower half), will be assigned as deputy chief of staff, intelligence, Resolute Support; and deputy director, operations and support, U.S. Forces-Afghanistan. Aeschbach is currently serving as chief of staff, Naval Information Forces, Suffolk, Virginia. Rear Adm. (lower half) Kyle J. Cozad, selected for promotion to rear admiral, will be assigned as commander, Naval Education and Training Command, Pensacola, Florida. Cozad is currently serving as commander, Patrol and Reconnaissance Group, Norfolk, Virginia. Rear Adm. (lower half) Marcus A. Hitchcock will be assigned as commander, Navy Warfare Development Command, Norfolk, Virginia. Hitchcock is currently serving as commander, Carrier Strike Group 3, Kitsap, Naval Base Kitsap, Washington. Rear Adm. (lower half) Roy I. Kitchener will be assigned as deputy, U.S. Military Representative to NATO Military Committee, Brussels, Belgium. Kitchener is currently serving as commander, Expeditionary Strike Group 2, Virginia Beach, Virginia. Rear Adm. (lower half) Danelle M. Barrett will be assigned as director, Navy Cyber Security Division, Office of the Chief of Naval Operations, Washington, District of Columbia. Barrett is currently serving as deputy director, Operations, J3, U.S. Cyber Command, Fort Meade, Maryland. Rear Adm. (lower half) James S. Bynum will be assigned as director, J-5, U.S. Northern Command, Peterson Air Force Base, Colorado. Bynum is currently serving as commander, Carrier Strike Group 9, San Diego, California. Rear Adm. Hugh D. Wetherald will be assigned as director, Warfare Integration, N9I, Office of the Chief of Naval Operations, Washington, District of Columbia. Wetherald is currently serving as deputy director for Resources and Acquisition, J8, Joint Staff, Washington, District of Columbia. Rear Adm. (lower half) Ann M. Burkhardt will be assigned as director, Sexual Assault Prevention and Response Office, Arlington, Virginia. Burkhardt is currently serving as director, 21st Century Sailor Office, N17, Office of the Chief of Naval Operations, Washington, District of Columbia. Rear Adm. (lower half) Gregory J. Fenton will be assigned as commander, U.S. Naval Forces Japan; and commander, Navy Region Japan, Yokosuka, Japan. Fenton is currently serving as director, Operations and Plans, N31, Office of the Chief of Naval Operations, Washington, District of Columbia. Rear Adm. Craig S. Faller will be assigned as senior military assistant to the secretary of defense, Washington, District of Columbia. Faller is currently serving as chief of legislative affairs for the secretary of the Navy, Washington, District of Columbia. Rear Adm. James T. Loeblein will be assigned as chief of legislative affairs for the secretary of the Navy, Washington, District of Columbia. Loeblein is currently serving as assistant deputy chief of naval operations for Operations, Plans, and Strategy, N3/N5B, Office of the Chief of Naval Operations, Washington, District of Columbia. Rear Adm. Stuart B. Munsch will be assigned as assistant deputy chief of naval operations for Operations, Plans, and Strategy, N3/N5B, Office of the Chief of Naval Operations, Washington, District of Columbia. Munsch is currently serving as senior military assistant to the deputy secretary of defense, Washington, District of Columbia. Rear Adm. (lower half) Linnea J. Sommer-Weddington will be assigned as deputy director, Command, Control, Communications and Computer Systems (C4) and Information Technology, U.S. Strategic Command, Offutt Air Force Base, Nebraska. Sommer-Weddington is currently serving as deputy director, Warfare Integration, N2/N6FA, Office of the Chief of Naval Operations, Washington, District of Columbia. Rear Adm. (lower half) Bret C. Batchelder, selected for promotion to rear admiral, will be assigned as director, Assessment Division, N81, Office of the Chief of Naval Operations, Washington, District of Columbia. Batchelder is currently serving as commander, Navy Warfare Development Command, Norfolk, Virginia. Rear Adm. (lower half) Eugene H. Black will be assigned as commander, Carrier Strike Group 8. Black is currently serving as deputy commander, U.S. Naval Forces, U.S. Central Command; and deputy commander, U.S. 5th Fleet, Manama, Bahrain. Rear Adm. (lower half) Dell D. Bull will be assigned as commander, Carrier Strike Group 3, Naval Base Kitsap, Washington. Bull is currently serving as chief of Naval Air Training, Corpus Christi, Texas. Rear Adm. (lower half) Stephen C. Evans will be assigned as commander, Carrier Strike Group 2, Norfolk, Virginia. Evans is currently serving as commander, Naval Service Training Command, Great Lakes, Illinois. Rear Adm. (lower half) John V. Fuller will be assigned as commander, Carrier Strike Group 1, San Diego, California. Fuller is currently serving as commander, Navy Region Hawaii; and commander, Naval Surface Group, Middle Pacific, Pearl Harbor, Hawaii. Rear Adm. (lower half) Michael P. Holland will be assigned as commander, Submarine Group 10, Kings Bay, Georgia. Holland is currently serving as director, Maritime Headquarters, N03, U.S. Pacific Fleet, Pearl Harbor, Hawaii. Rear Adm. (lower half) Jeffrey W. Hughes will be assigned as commander, Expeditionary Strike Group 2, Virginia Beach, Virginia. Hughes is currently serving as commander, Navy Recruiting Command, Millington, Tennessee. Rear Adm. (lower half) Thomas E. Ishee will be assigned as director, plans and operations, U.S. Naval Forces Europe – 6th Fleet; deputy commander, 6th Fleet; commander Submarines, Allied Naval Forces South; and commander, Submarine Group 8, Naples, Italy. Ishee is currently serving as deputy commander, Joint Functional Component Command for Global Strike, U.S. Strategic Command, Offutt Air Force Base, Nebraska. Rear Adm. (lower half) Stephen T. Koehler will be assigned as commander, Carrier Strike Group 9, San Diego, California. Koehler is currently serving as director, Fleet and Joint Training, N7, U.S. Fleet Forces Command, Norfolk, Virginia. Rear Adm. (lower half) Peter G. Stamatopoulos will be assigned as director, Supply, Ordnance and Logistics Operations Division, N41, Office of the Chief of Naval Operations, Washington, District of Columbia. Stamatopoulos is currently serving as deputy chief of staff for Fleet Ordnance and Supply; and fleet supply officer, N41, U.S. Fleet Forces Command, Norfolk, Virginia. Rear Adm. (lower half) William W. Wheeler III will be assigned as commander, Patrol and Reconnaissance Group, Norfolk, Virginia. Wheeler is currently serving as deputy commander, Joint Task Force Horn of Africa, Camp Lemmonier, Djibouti. Rear Adm. (lower half) Kenneth R. Whitesell will be assigned as commander, Carrier Strike Group 4, Norfolk, Virginia. Whitesell is currently serving as commander, Carrier Strike Group 2, Norfolk, Virginia. Rear Adm. (lower half) Jesse A. Wilson Jr. will be assigned as commander, Naval Surface Force, U.S. Atlantic Fleet, Norfolk, Virginia. Wilson is currently serving as director, Assessment Division, N81, Office of the Chief of Naval Operations, Washington District of Columbia.